In the news today – Michael Deas’s portrait imagining what a young Martha Washington looked like. ("By George, Martha was a hot mama" exclaimed the New York Post.) Commissioned as the cover of Patricia Brady’s definitive biography of America’s first First Lady, the likeness was based primarily on a computer generated age-regression image created at Louisiana State University’s forensic anthropology department. So when photographs and photoshop fail to flatter, we can always go back to the painted image. Deas is a noted realist painter more in the tradition of Parrish than Wyeth. 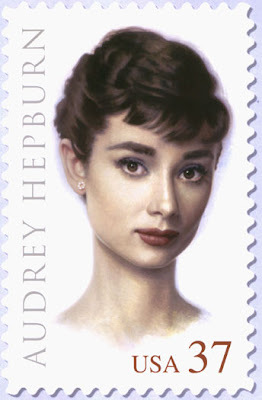 You’ve seen his work without knowing it as he created the current Columbia Pictures logo as well as recent U.S. stamps commemorating movie stars like Audrey Hepburn, Cary Grant, and Marilyn Monroe. 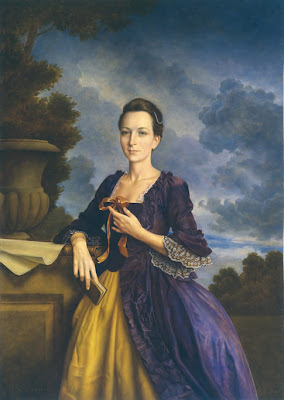 Mount Vernon, the historic home of George and Martha Washington, recently acquired Deas’s portrait of Martha where it will now remain on permanent display. The more conventional view of Martha. 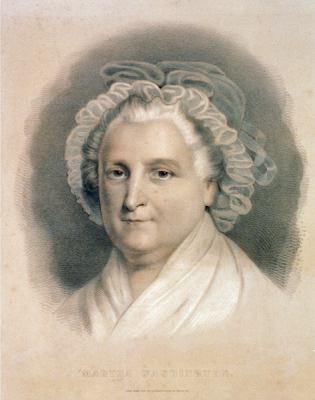 Left - miniature portrait of Martha Washington, watercolor on ivory, by James Peale, 1796. Right - detail of Deas's portrait. 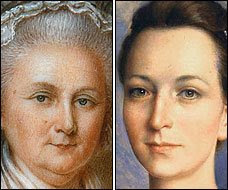 It is passing strange that an "age regression" portrait of Martha Washington would be created from a circa 1790s portrait of Martha in her sixties, when the Mount Vernon estate has on display a lovely, full figure portrait of Martha at age 27, originally painted in 1757 by artist John Wollaston, then the finest painter working in Virginia. The early Martha portrait owned by Mt. Vernon is actually a faithful reproduction executed about 1850 by Ernest Fisher, working from the original. Mt. Vernon also owns the original 1757 Wollaston portrait of Martha's two children (Jack and Patsy, from her first marriage to John Parke Custis), confirming the accuracy of Fisher's copy. The portraits of Martha and her children are prominenty displayed in the first floor Blue Parlor at Mt. Vernon. A comparison of the "from life" 1757 portrait with Michael Deas' imaginary composition reveals few similarities. Around our house, we refer to the Columbia Pictures logo as the Annette Bening statue. Thanks for the additional information and pointing out the pitfalls of superficial research. I also have always thought the Columbia Pictures logo model must have been Annette Benning. This Martha may fit some anorexic 21st c. image, but she would fall short in the 18th c. I'm saddened that Martha is only worth noticing as a "hottie", not for her own place in history as a supporter of the AWI, of the fledgling Republic, and as our first First Lady. I'm intrigued by the woman in the Washington and Lee portrait. She looks like a woman who could survive widowhood, run a household, love a soldier and do her duty with grace and strength. Deas portrait? Pretty, but empty. Hopefully, this portrait will be a starting place for people to discover Lady Washington.